Incredibly versatile, mix PhD Diet Whey Powder with yoghurt to make a delicious dessert, or combine with porridge oats or pancake mix for a tasty & filling breakfast. Blend 25g PhD Diet Whey Powder Salted Caramel with 175ml cold water. Use 2-3 servings daily to help support adequate protein intake. Take any time of the day pre- or post-workout. PhD Premium Protein Blend (Whey Protein Concentrate (Milk), Milk Protein Concentrate (Of which 80% is Micellar Casein), soya protein isolate], waxy barley flour, golden brown flaxseed powder, flavouring, thickeners (acacia gum, guar gum, xanthan gum), reduced fat cocoa powder, conjugated linoleic acid powder [safflower oil (rich in linoleic acid), glucose syrup, emulsifier (soya lecithin), milk protein, vitamin e], l-carnitine, salt, green tea extract, sweetener (sucralose). 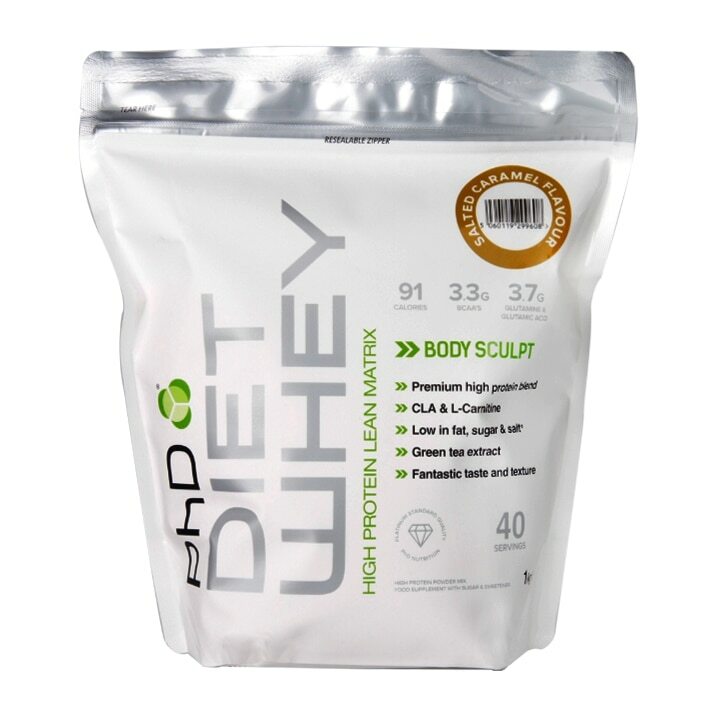 PhD Diet Whey Salted Caramel is rated 4.9 out of 5 by 17. Rated 5 out of 5 by Nazz23 from Great protein I'm really happy with this protein powder. It mixes really well in my shaker, and blends really well too. It tastes fantastic on its own with water, though usually I use a mix of water and oat milk (3:1 ratio) to thicken it a bit and put stuff like milled chia/flax seeds, strawberries, bananas etc with it. So good. I adore caramel so I will definitely be buying more and trying others in the range when they go on penny sale again ;) Keeps me feeling full and energised until lunch! I replace my breakfast with this shake as I'm always in a rush so I need something to take with me.